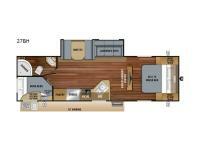 Looking for bunk beds for the kids, kitchen amenities for the cook, and a private bedroom for yourself in your next RV? 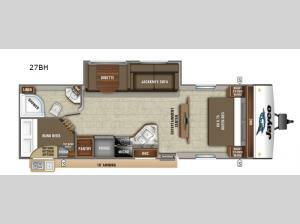 This Jay Feather travel trailer 27BH provides all those wishes, plus some! After your adventure outdoors is over for the day, come back to the comfort of a living space with a sofa and the dinette for meals or playing games with the kids. Everyone can get cleaned up in the full bath which is next to the double bunk beds with a privacy curtain and top bunk shelf. You might even decide to add an optional outside kitchen to enjoy the outdoors under the awning. Stop looking, you found it!